The Montgomery area boasts eateries to fit every taste and budget, from fast food to fine dining. No conversation about Cincinnati dining is complete without a reference to the Montgomery Inn, which regularly ships its distinctive barbecued ribs and chicken to fans (some of them very famous) around the world. Founded by Ted Gregory in 1951, the humble inn began its rise to fame when Ted's friends sampled his wife's barbecue sauce - the rest is history. Dining at the original location in Montgomery is something every Cincinnatian must do at least once. When not in the mood for barbeque, the casually elegant Stone Creek Dining Company offers American favorites, and Eddie Merlot's features steak, seafood and wine. For an ethnic twist, try Italian cuisine at its best at Germano's Ristorante Italiano, Pomodori Pizzeria and Trattoria, or, for Greek and Middle Eastern fare and custom coffee roasts, stop by the folksy European Café. Those on a budget can sample Mai's Pacific Rim and Mekong Thai for economical Asian cuisine. 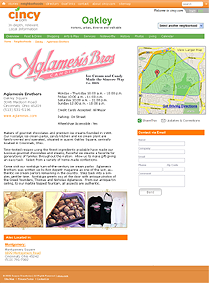 For dessert, visit Aglamesis Brothers’ traditional parlor – its marble-counter décor and real, homemade flavor are not to be missed (incredible gourmet chocolates, too!). Montgomery is a family-friendly suburb that also offers fun highlights for singles and couples. For an upscale evening out, check out Carlo and Johnny, a former speakeasy transformed into a glamorous steakhouse with a 1930s theme. Those who like a laugh must visit Go Bananas Comedy Club, which features national headliners on the weekends, and rising local talent on Wednesday’s “Pro-Amateur” night. The Village Tavern in Old Montgomery, established in 1889, is a favorite local hangout – and offers karaoke on Thursdays, Ladies’ Night on Saturdays and Bengals games on Sundays. For die-hard sports fans, Willie’s Sports Café is owned by local radio personality Bill Cunningham, and is a great place for loud music and catching the game on a big screen. The area also features a Buffalo Wild Wings, chain restaurants with full bars open late, and a smattering of smaller neighborhood pubs. For a quiet evening, a stroll through Montgomery’s Heritage District sets a romantic mood with brick walkways, polished wood pergolas and landscape lighting.